Shares of Costco Wholesale (NASDAQ:COST) jumped 5% trading following the warehouse retailer’s positive earnings news on March 7. But broader market pressure put a damper on COST stock despite strong results. But it’s because of those good results that this action caught our eye. After the big move, Costco stock continued to climb, leaving many investors to wonder what to do now. Is there still time to get long? 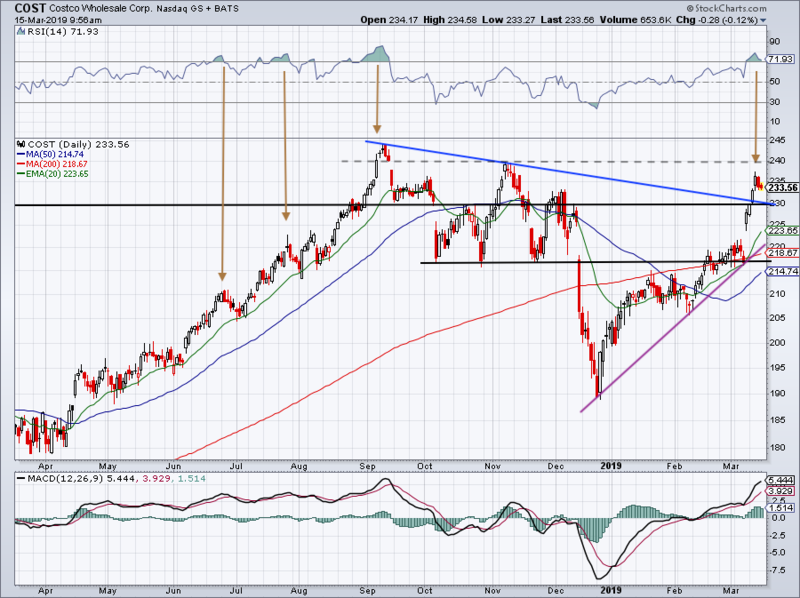 Costco stock is setting up as a solid long for several reasons. Let’s discuss three of them. For the fiscal second quarter, Costco stock reported earning per share of $2.01, 31 cents ahead of expectations. That 18% earnings surprise pushed the performance up more than 40% year-over-year (YoY). However, revenue of $35.65 billion came up short by more than $250 million, despite growing more than 7.2% YoY. A bottom-line beat and top-line miss can spell trouble for a stock, particularly on a bad market day like the one we had on Friday. But that wasn’t the case for COST stock and I think it’s due to the strength in the business once we dig past the headline results. Forex and gas deflation weighed on revenue, as did the weather in some cases. Given the winter we’ve had, it’s hard to deny that as a factor. If these issues caused the miss, investors were apparently fine with overlooking the sales shortfall. Further, U.S. comp-store sales jumped 7.2% YoY, but online sales were even more impressive. E-commerce comps jumped 25.5% YoY, showing just how well Costco is adjusting its business model for its customers. To be sure, the results could have been stronger, but it was still a pretty good showing for one of the market’s premier retailers. Coupled with some of the catalysts below, the report is enough to help, not hinder COST stock. After a solid rally on Friday, March 8, COST stock followed up with an explosive move higher on the following Monday and Tuesday. All told, shares are now up around 8% since reporting earnings. However, according to the relative strength index, the stock price was overbought in the short-term. As shown in the chart above, over the past 12 months this type of condition has tended to put pressure on Costco stock in the short term. If we get that here, I would love to see a few days of sideways action and/or a slight pullback. It would be a very healthy way for Costco stock to digest the big rally. On a pullback, it would be bullish to see the $230 level hold as support and give its 20-day moving average a chance to catch up to the move. If COST stock starts to move higher again, $240 could be a reasonable upside target, with former highs near $245 as the second target. On the downside, I’m watching $230. If it doesn’t hold, I want to see the 20-day or uptrend support hold. Below $225 and Costco stock will be concerning from the long side over the short-term. Overall though, it’s hard to be too bearish after a rally like this. We’re halfway through Costco’s fiscal year and full-year estimates are impressive. Analysts now expect the company to earn $7.92 per share, up 11.7% from last year, with 7.7% sales growth. For next year, consensus expectations call for a deceleration in growth as analysts expect earnings and revenue to grow 7.4% and 6.9%, respectively. It’s worth pointing out that current-year estimates of $7.92 per share are up from $7.76 just a week ago. Still, Costco stock trades at a premium, at 29 times this year’s earnings. That’s in-line with its five-year average, while its forward price-to-earnings ratio of ~27 is roughly in-line as well. However, COST stock is trading at a premium to some of its other metrics. Is that premium deserved? Like Home Depot (NYSE:HD) and other premier companies, Costco knows it won’t dominate Amazon (NASDAQ:AMZN). Because it collects an annual fee from its 52 million members and retains a high percentage of those members (with a retention rate above 90% last quarter), Costco has flexibility. Its online and same-day delivery show strong growth and Costco will be one of the companies that not only survives but thrives from e-commerce growth. When it comes to dividend yield, Costco is no Kohl’s (NYSE:KSS), as it pays out just 1%. However, last April the company bumped this payout by 14%, which is roughly in-line with its five-year average of 14.5% annual dividend growth. That’s a solid raise to receive each year, particularly considering how well COST stock has done in that span as well, up 105%. Costco stock isn’t cheap, but it deserves its premium valuation as a blue-chip retailer. The post 3 Reasons to Buy Costco Stock After Strong Earnings Show Business Strength appeared first on InvestorPlace.